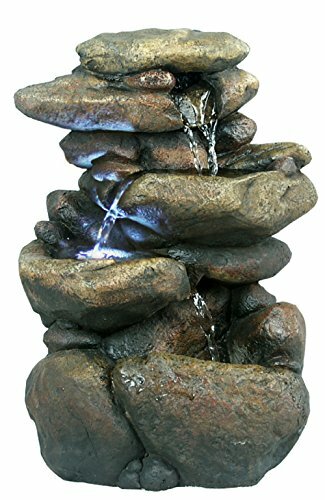 Here's the Alpine Indoor/Outdoor 3-Tier Rock Fountain with LED Light, a marvel of modern fountain work, perfectly capturing the beauty of basic geology. Place this fountain anywhere and you'll be transported to a serene nature setting, willfully letting cares drift away. Includes a six-foot cord and all components necessary for installation and operation. Bring the sound of nature into your home or office with this 3 Tier Rock Tabletop Fountain. The water cascades down through the rocks creating a gentle, soothing flowing sound. A water capacity of 68 oz. means you can enjoy your fountain with little upkeep.